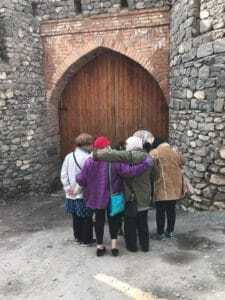 From March 6-15, 2017 Sisterhood of Salaam Shalom® members experienced the unique and successful model of peaceful coexistence among people of different faith groups and cultural backgrounds in Azerbaijan! Our group of women learned how Muslims and Jews, Shiites and Sunnis live together in peace, harmony and dignity. We met with dignitaries, religious leaders (including the Grand Mufti of the Caucasus who is the world’s only Shia-Sunni Grand Mufti), community members, and artisans. 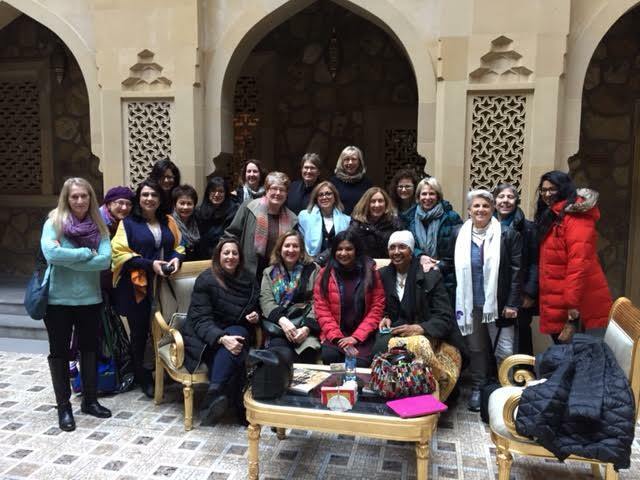 Our group toured the beautiful region — including Baku’s Old City and its cosmopolitan center, and followed the silk route as we visited the mountain communities of Sheki, Gabala, Oquz and Quba. Check out this trip report from participant Marcia Bronstein. While in Baku, we attended Jummah prayer at a mosque and Shabbat and Purim services at a synagogue. We participated in a master cooking class and savored the mouthwatering food of Azerbaijan, a blend of Eastern European and Middle Eastern flavors. Participating in the citywide festival, the Festival of Fire, which precedes Novruz, a traditional holiday in Azerbaijan, which celebrates the New Year and the coming of Spring. Lodging, three meals a day, and airfare included in the total trip cost of $2,100. THE TRIP IS NOW FULL. We are accepting a waiting list. Email sheryl@sosspeace to be put on the waiting list. . For more information and a detailed itinerary, please email Sheryl Olitzky. For more information about Azerbaijan, please visit azerbaijan.travel.